The advanced, Toshiba Aquilion 16 mobile CT scanner features a wide variety of enhanced features designed for increased patient comfort and safety, fast scanning and exam times, and improved imaging quality for greater diagnosis accuracy and confidence. In just 400 milliseconds, the gantry of this CT system can rotate around the patient’s entire body, and at these speeds, this system can effectively reduce image distortions of moving organs (heart, lungs, etc). While scanning, this CT’s image reconstruction time averages around 0.10 seconds. Furthermore, the Toshiba Aquilion features Toshiba’s innovative SUREStart technology, which tells the CT scanner to begin scanning when the image contrast reaches its target area. Also, when it starts scanning, the Aquilion aims to use the lowest dose possible. 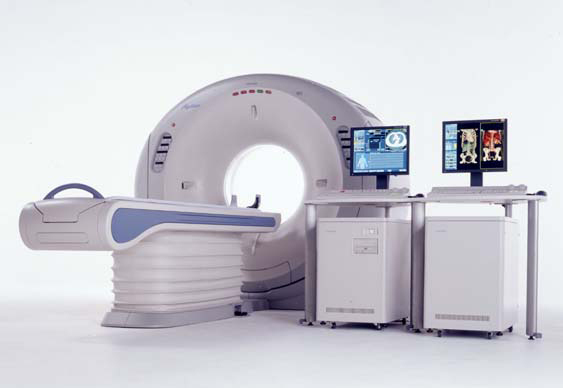 The Aquilion is especially good for cardiac and lung studies in the 16-slice CT scanner class because of its fast gantry. It also has an ergonomic user console that some of our customers find pleasing.